Suntanned punters took everyone by surprise by flocking back to the auctions sooner than expected and sending prices skywards by frenziedly outbidding each other. 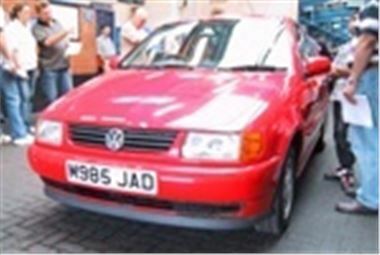 The 80,500 mile Polo 1.3CL 3-door in the photo had power steering, but came in several shades of red and with a severely rusted front valence. It started sensibly enough at £1,500 but accelerated rapidly past prudence, overtook common sense and ran away on a sea of hands to sell for an insane £2,600. It wasn't all that way. Bearing in mind the £6,150 a Mk IV Golf sold for last week, I was up for paying £6,500 for a scruffy, stone chipped 58,000 mile 98S 1.6SE with a/c. Unfortunately for me, that was where the bidding started, but the car eventually sold for £7,300 which was still £550 short of trade book for a good one. The real bargains came from South Korea in the form of a tidy 52,000 mile 98S Hyundai Lantra 1.6 Siena, sold away for £3,175 and a sensible 56,000 mile 98S Daewoo Leganza CDX sold for £3,600. Both were plenty of car for the money. As was a 42,000 mile 99T FIAT Marea 155 HLX 20v Weekend which raised a top bid of just £4,500. Even lumpy E46 BMWs are getting down to the £10k bracket with an air-conditioned 91,000 mile 99T 318iSE selling for its reserve of £10,400. While £9,525 looked about right to me for a 59,000 mile 97R Mercedes C240 Elegance automatic. But big money was there by the mattress-full for clean cars steeped in status: £9,400 for a 52,000 mile 98R MGF with a hard-top; £11,050 for a 29,000 mile 98S E36 BMW 318iS coupe; £12,350 for a 29,000 mile 97R BMW Z3 1.9 Roadster; £12,750 for a 13,000 mile 2001X Alfa 156 1.8TS with alloys and a/c (more than an import costs new); £15,050 for a 78,000 mile 99T BMW 528iSE auto; £18,400 for a 46,000 mile 99T Jaguar S-Type 3.0 V6SE auto; £24,000 for a 28,000 mile 2000X BMW 330CI; £26,000 for a 9,000 mile 2000X Mercedes E320 CDI Elegance auto; and £28,000 for a 16,000 mile 2000X Mercedes E320 Avantgarde 7-seater estate. So it looks like you heeded last week's advice to get to the auctions and snap up a bargain. Only problem is, there's too many of you.